It's that time of year again! 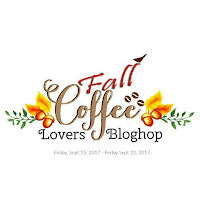 The Coffee Loving Cardmakers are having their quarterly blog hop! Click on the image below to go see all the wonderful Autumn inspired creations. It's Spring here in Australia, but still a bit chilly so warm coffee is always good for that. Speaking of which...I had the most amazeballs Dirty Chai the other day...so SO good! Anyway...I digress as usual! So...as a big fan of coffee and tea )and caffeine in general!) I have amassed quite a collection of coffee and tea themed craft supplies. So...what to use? I shall attempt (although I cant promise) more than one card but here is the first one. I wanted to use the Verve stamp set called "Coffee" that I've had on my stash for quite a long time. They still sell it, although there is a new one out too. In particular the stamp "This girl runs on" shouted to me. Very loudly. There is also a word die which I used instead of stamping it. I felt this sentiment needed a girl and "Latte Anya" from The Greeting Farm came to my rescue. The next ideas that pushed their way to the front were using the Tim Holtz embossing folder and using a diffuser to get a flat circle in the centre. You can't easily see it, but it meant I could stamp there and I considered colouring the image on it, bit later forgot about that! It definitely wasn't a very well planned design, but sometimes you just have to stick ad go and not over think it. True Stories has bold colours which I do associate a bit more with winter, but I felt the olive green, red, yellow warm grey and warm pink etc would work for Autumn too...and Anya happens to also be bundled up in warm clothes! NPCH* felt it was Autumny enough, but I didn't so I added some leaves in the form of clear stickers from the "Go Now Go" sticker book (also by Shimelle). The acorns needed to be backed with white cardstock first to stand out enough. A touch of Glossy Accents makes the heart look more like a button and co-ordinate with the shiny clear stickers. The card itself isn't a standard size so I'll have to make a custom envelope. I wanted the dry embossed coffee cups to be as big as it could be since the diffuser took up most of the centre. The other layers were built around it. Being used to a 12x12 scrapbook canvas, a card size is always a bit of a shock! 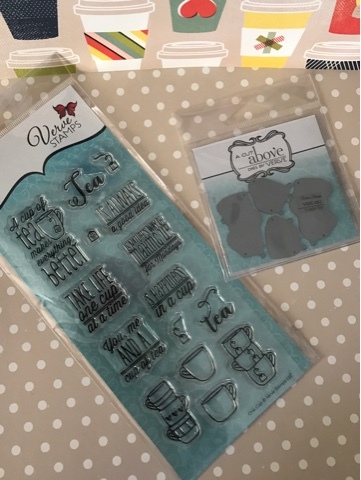 I have this tea themed stamp and die set by Verve to give away, This is NOT sponsored - I just forgot I had one and bought it twice! Oops! Love that Verve stamp set. It would be lovely to win it. So I did all you asked to maximize my chances. You card is so adorable...that is my mantra to...THIS gal really DOES run on coffee. Enjoy your springtime. I hope to visit your country someday. I just became your newest and first (I feel so honored) blog follower, followed you on Facebook and Instagram, and subscribed to your YouTube Channel. Thanks for the fun give-away! Also, I love your card and I look forward to visiting your blog again soon. I love anything related with tea or coffee and this one is soooooo cute and adorable! Would love to win some Verve cuteness! Followed all the steps and I am on number 2:) Thanks for the opportunity and graceful giveaway to win! How sweet she is! I love the acorn in her hat, adorable. This card is so adorable Alex! Love it! What a fantastic card!! Thanks so much for the chance to win such a great prize. I followed you on Instagram, Facebook, YouTube and on your blog here. You make such pretty cards AND you like cats!! As someone who is owned by two cats and also makes cards, I think that's wonderful!! LOL BTW, I love your acronym for your hubby. So cute!! This is gorgeous! Love that adorable girl.. LOVE the coffee cups and love how you built your sentiment! Love your sweet card and thanks for the giveaway! Wonderful card design you made. Thanks for a chance to win that tea set too! Thanks for the opportunity to win as well! !